HomeBlogSEOProgressive Web Apps – The future of mobile? Progressive Web Apps – The future of mobile? One thing that you will notice as you read around the subject and indeed the industry is that many writers have picked out similar trends to us, the reason for this is that Google and the other search engines are talking about them and implementing many of them as ranking factors. Much talk across the industry surrounds mobile search, and the rise of this as a platform. Over the last two years, more and more has been written on the subject, especially as mobile overtook desktop search for the first time, a trend which has not only held, but continued to rise. The importance of being fully optimised for mobile is a given and the loss of traffic if you aren’t can be significant for businesses. One area that we feel has been overlooked recently however is the use and development of Progressive Web Apps (PWA) to assist with basic search queries. A PWA is an app that combines the best of a website with the ease of an app. It uses an almost ‘blind’ method of searching whereby you open the app and it will display what you want based on previous preference. They are websites that enable an app shell and configuration file to be downloaded to a smartphone, which allows the app to take on all the best characteristics of a native app while living on the web. They allow for an app icon, full-screen display without an address bar, speedy on- and offline functionality and push notifications. They are a good way to help companies build a bridge between the discoverability of the web and the engagement and satisfaction that users experience with apps, all while minimising overheads. They can be used directly on the web or installed like a native app on Android devices (and iOS devices soon, too). That means there is a lot less to maintain, optimise and promote, so they are incredibly attractive to savvy companies of all sizes. “The app development trends will start to shift away from native apps and toward PWAs as more companies begin to understand the value that PWAs can provide. 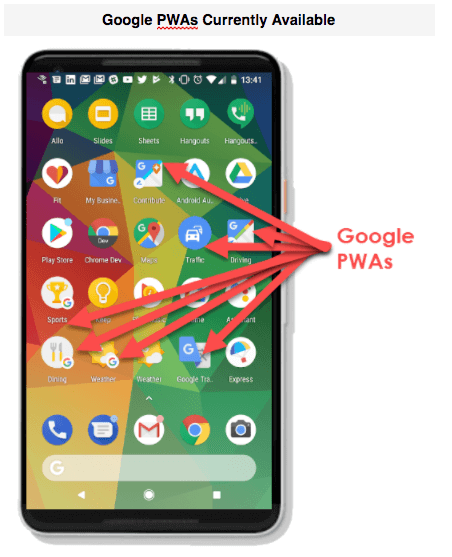 So what makes a PWA? Progressive – By definition, a progressive web app must work on any device and enhance progressively, taking advantage of any features available on the user’s device and browser. Discoverable – Because a progressive web app is a website, it should be discoverable in search engines. This is a major advantage over native applications, which still lag behind websites in searchability. Linkable – As another characteristic inherited from websites, a well-designed website should use the URI to indicate the current state of the application. This will enable the web app to retain or reload its state when the user bookmarks or shares the app’s URL. Responsive – A progressive web app’s UI must fit the device’s form factor and screen size. App-like – A progressive web app should look like a native app and be built on the application shell model, with minimal page refreshes. Connectivity-independent – It should work in areas of low connectivity or offline. Re-engageable – Mobile app users are more likely to reuse their apps, and progressive web apps are intended to achieve the same goals through features such as push notifications. Installable – A progressive web app can be installed on the device’s home screen, making it readily available. Fresh – When new content is published and the user is connected to the Internet – that content should be made available in the app. Safe – Because a progressive web app has a more intimate user experience and because all network requests can be intercepted through service workers, it is imperative that the app be hosted over HTTPS to prevent attacks. An example of ‘blind’ searching through these apps would be the default weather app on iPhone. This app is linked in the background to a search engine and a live weather reporting tool. After selecting the app and filling in your ‘home’ location preference for the first time, future searches will display real time weather for your pre-set ‘home’ location. By allowing the app to use your exact location through GPS, you will again get a real time, location specific update. The search function then truly comes into its own when you want to look within an app for the weather in a different location and the results are displayed. One of the key benefits of using these apps is the speed at which information can be gathered. People can check the most basic of things in an instant and leave a full web-based search for the finer detail. With 53% of users abandoning a site if it takes longer than three seconds to load, the instant nature of these apps negates that drop off. Another benefit is that the service is reliable regardless of the network status. According to Google developers: “When launched from the user’s home screen, service workers enable a Progressive Web App to load instantly, regardless of the network state. The final key benefit is that the use of PWAs can offer good user experience. They live in accessible place on the smartphones’ home screen and can re-engage with push notifications. All of this correlates with my thoughts on one of the other trends for 2018 – voice search. Voice search will grow and thanks to machine learning the depth of the answers that you receive will increase, but at the moment there do seem to be limitations. Many use these devices to simply set alarms, find out things such as train times, the weather, news headlines, sport scores and play music. All of these functions can be done with an app and more importantly on the go which shows why investing in mobile strategy is a must. Our organic search experts are passionate about SEO. Contact us today to claim your free site review and find out how to increase relevant traffic, boost conversions and drive up revenue.